Tripp Lite's P137-06N-HD-UHD Keyspan Mini DisplayPort 1.2 to UHD 4K HDMI Active Adapter/Video Converter allows you to connect a Mac or PC with a Mini DisplayPort or Thunderboltâ„¢ output to a UHD 4K HDMI TV. and Microsoft Surface. Mac 10.11, Windows 10 Compatible. Compatible with the Thunderbolt port on Mac computers. Supports Ultra High Definition (UHD) video resolutions up to 4K x 2K (3840 x 2160) @ 24/30 Hz. Fully molded ends ensure long life enjoyment. 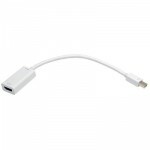 Converts both Single-Mode and Dual-Mode (DP++) Mini DisplayPort output, and is perfect for use with graphics cards, such as AMD Eyefinity, that do not output DP++ signals. â— The P137-06N-HD-UHD supports transmission of an audio signal as long as it is supported by the Mini Displayport source-check the documentation for your Mini Displayport source for compatibility. â— Monitor with a HDMI port. â— Audio is supported as long as it is supported by the source. Check your Mini Displayport source documentation for compatibility. â— The P137-06N-HD-UHD is an Active adapter, and requires that the connected computer has a DP++ ( Displayport ++ ) port, which allows HDMI and DVI signals to be passed through; check the documentation for your Mini Displayport source for compatibility.